U.S. sites have appeared in the night the first tests of the new iPad to be released in the U.S. as in France tomorrow. Meanwhile our full test of the third tablet from Apple, here's what to remember this advice generally very enthusiastic. The first argument is obviously the new iPad's screen. Apple uses a Retina display for the last tablet and all opinions are unanimous: this screen is excellent. "Yes, this screen is terrible. It is fantastic. It's unbelievable." Summarizes The Verge. For all, even the best screen on a tablet, by far, even one of the best screens at all. Off the shelf, nothing has changed for good reason: Apple has kept the same screen size (9.7 inches) and the same around edges. With a resolution of 2048 x 1536 pixels, the screen loads over three million pixels, and it shows. Or rather, it is invisible: the basic principle of Retina screens is just that the pixels are not visible to the naked eye. The conclusion is unanimous: Apple has succeeded in his new challenge and found the same impressions that move to a Retina display on the iPhone 4. If you have had the experience of crossing the screen from an old iPhone to the iPhone Retina display of 4 or 4S, you will not be surprised with the new iPad screen (Daring Fireball) The screen resolution of the new iPad is less than that of the iPhone 4S: 264 ppi "only" against 326 ppi. In use, this difference is not seen, since we take a tablet at distance generally larger eyes than a phone. Better, the Retina display of the new iPad even seemed better than the iPhone 4 on numerous occasions. Joshua Topolsky evokes a "sheet of paper illuminated" and this screen is especially effective for text, but also images. Back of the coin, this screen wills much better even better value in the low-resolution images. 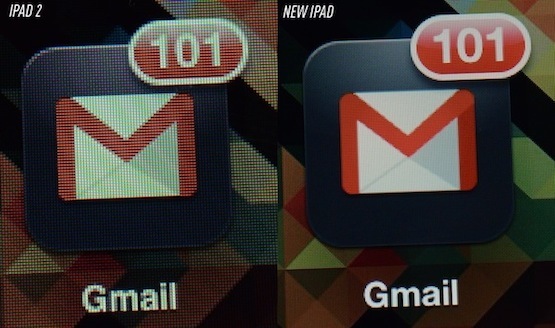 With the new iPad, everything that is not suited to the Retina display is immediately and it becomes very annoying. This is particularly true for websites that use many images in standard definition. Macworld tempers this advice a little enthusiastic. 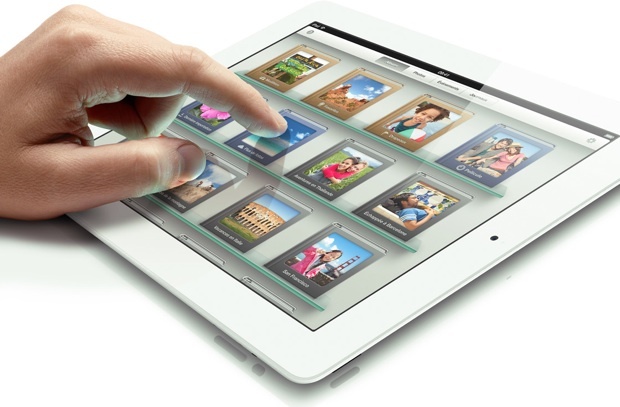 Certainly, the iPad screen of the third generation is impressive, but the iPad 2 was already very good: Buyers of the third generation iphone will love the Retina display, but the fact is that the screen of the iPad 2 was also excellent. Perhaps simply the difference between the two screens is not as important as there was between the iPhone 3G and 4S. 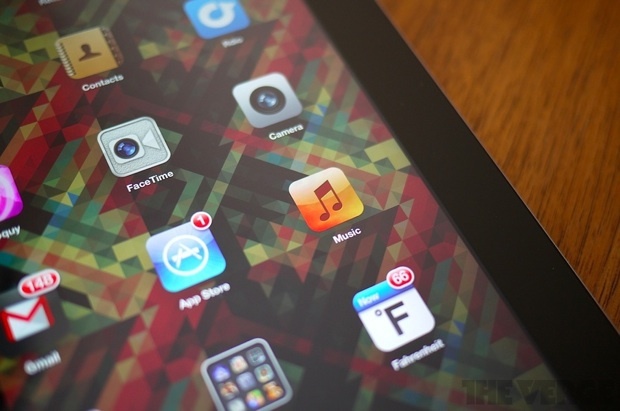 (Macworld) Apple took advantage of his new screen to change its color profile: the colors are warmer than the iPad 2. The manufacturer had also raised a saturation 44% higher for the new iPad and it is a success if we are to believe these early opinions, especially for photos. 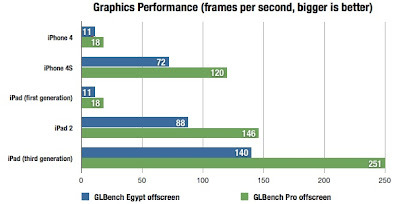 The iPad next generation is far better than the previous one, but better than the iPhone 4S.A contrast, the processor that powers the iPad 3 has not been changed and it is also seen in tests raw performance. 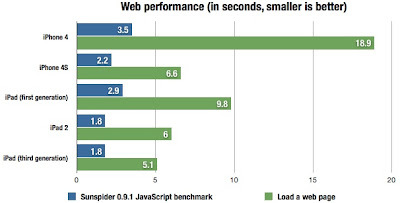 CPU power has not changed and the performance of mobile Safari is also quite stable between the two generations. In use, there is a difference, but it is rather to be sought in the RAM. Apple has doubled the amount of RAM in its tablet for the switch to 1 GB. As suggested by John Gruber of Daring Fireball, this additional amount is first used to screen Retina, but it is also useful for applications. Most obviously, not surprisingly, is in the browser where a greater number of tabs will remain open. IOS will also leaving more active applications in the background. 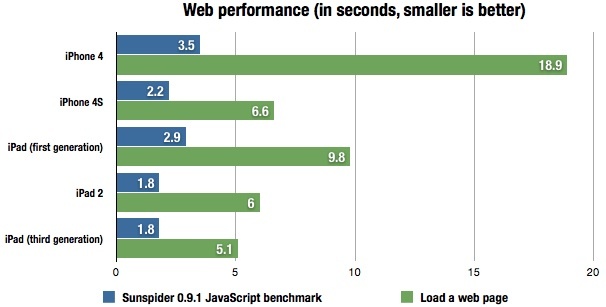 The new iPad is much faster in an area that really does not concern us at this time. All testers were very impressed by the speed of the tablet on a 4G LTE network. 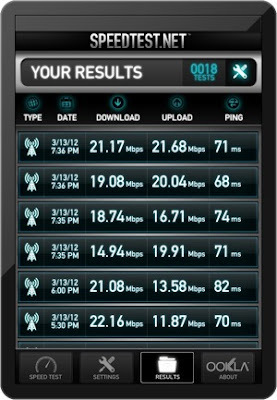 The Verge has done some testing with the application Speedtest.net Speed Test Mobile (Free) and the results are impressive: up to 22 Mb / s download and up to 21.7 Mb / s transmission. Actual speeds vary according to place of course, but they remain very high and Joshua Topolsky adds: "I think the iPad faster than many phones [4G LTE] I tested." The third generation iphone will unfortunately not compatible with 4G LTE networks of European. Not until the tests on this side of the Atlantic to judge gains for the new 3G iPad.